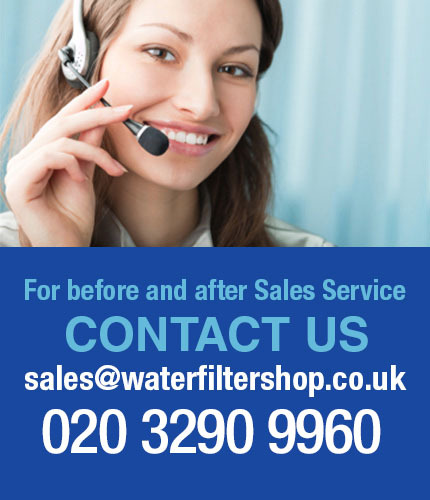 ✓ Complete with two Black Filters changed every 22,700 litres! 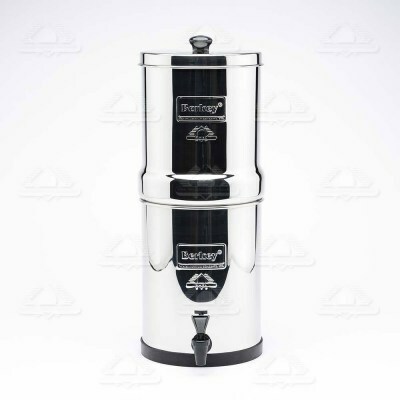 The Travel Berkey is the ideal travel companion for portable gravity water filtration which can be used anywhere. This beautifully constructed compact unit fits neatly into a travel bag making it a perfect choice for use during travel, such as camping and in a caravan, or in fact the ideal device to have during unexpected emergencies. Height when in use: 18"
Up to two PF-2 Fluoride and Arsenic Reduction Filters may be installed in the lower chamber of this system if desired. 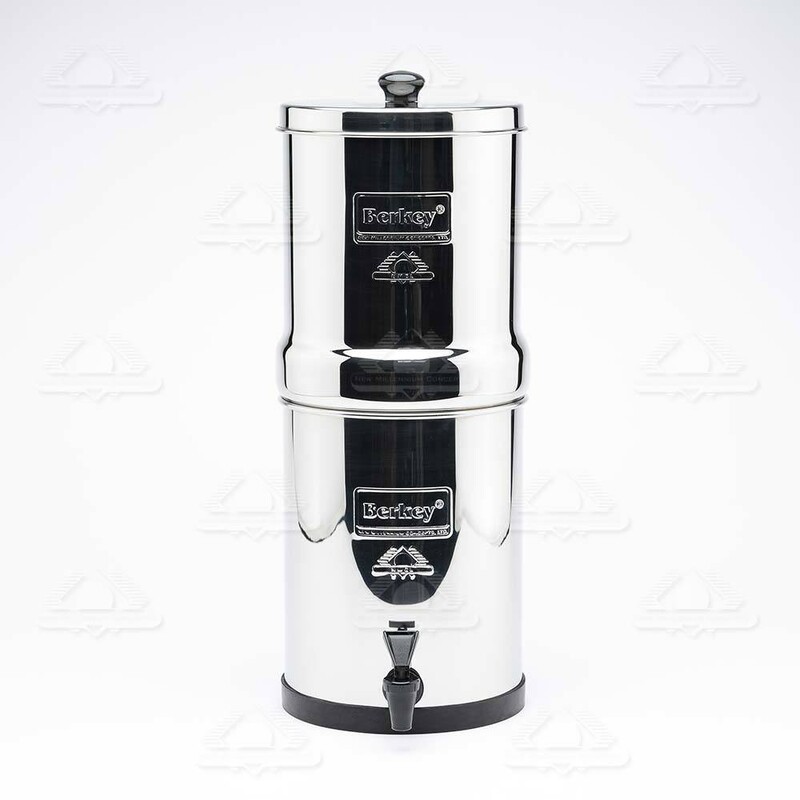 The system comes with two of the Black Berkey™ Purification Elements which are more powerful than any other gravity filter element currently available. 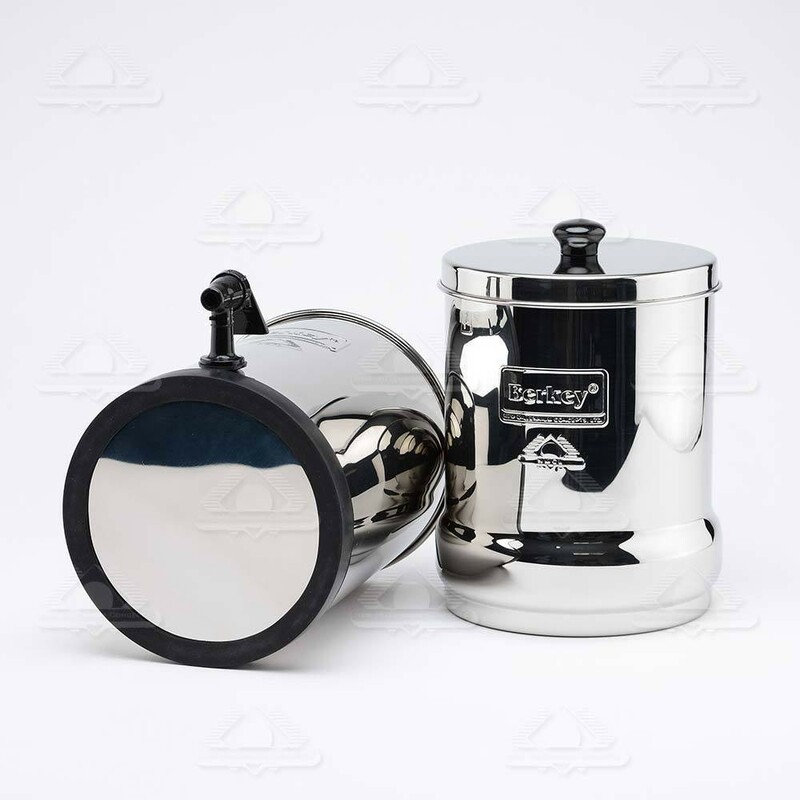 The micro-pores within the cleanable Black Berkey™ purification elements are so small that pathogenic bacteria are simply not able to pass through them. No need for expensive disposable filters. 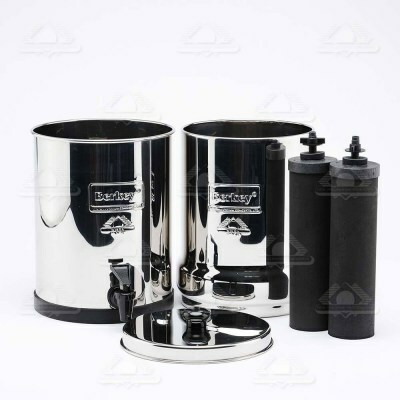 Black Berkey™ purification elements are cleanable. When the flow rate decreases simply brush the Black Berkey™ purification elements with a ScotchBrite® pad under running water, re-install and your system is again ready to purify water. Each durable and efficient purification element will last for up to 3,000 gallons (6,000 gallons per set of two - that's 22,700 litres!) and provide years of efficient water purification. Because the Black Berkey™ Purification Elements are so powerful they can remove red food colouring from water. This allows you a method to test your system periodically. We recommended that the Red Food Color Test be run after new systems are first assembled. We also recommend that they be tested every 3 to 6 months thereafter, after your system has been in storage or before taking your system on a trip or out of the country, in order to insure your system is functioning properly. Berkey PF-2 reduction elements are designed to be used exclusively with the Black Berkey filter elements and are especially designed to remove arsenic and fluoride to deliver you with cleaner, safer drinking water. The filters will last for up to 3000 uses, but should be replaced within a year, possibly sooner if they received regular use. FLUORIDE: Testing for fluoride was based on 20-30 ppm of the ion in the in-fluent aqueous solution at a flow rate of no more than 3 gpm (11 lpm) per cubic foot of media. Results of < 1 ppm of the fluoride ion in the effluent were typical for the media (>95% reduction). Under optimum conditions, effluent concentrations of less than 50 ppb were readily achieved (>99.75% reduction). ARSENIC: This product uniquely targets the entire family of arsenic oxide anions as well as the arsenic cations. 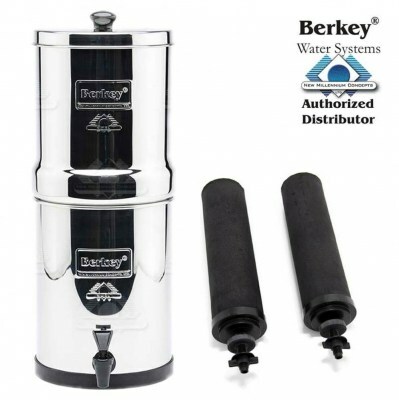 REPLACEMENT:Under normal conditions it is recommended that each set of two Berkey PF-2™ elements be replaced after 1,000 gallons (3,785 litres). The Royal Berkey™ system is about 3.25 gallons (12.3 litres) therefore the Berkey PF-2™ filters should be replaced after 1,000/3.25 (3,785/12.3) or 307 refills. If the system is refilled about one time per day, the Berkey PF-2™'s should be replaced after 10 months, if the system is refilled about twice per day, the Berkey PF-2™'s should be replaced about every five months). Actual capacity is dependent on the presence of other competing contaminants in the source water. High levels of fluoride, arsenic and heavy metals may reduce the capacity and efficiency of the elements. Do not boil this element. Berkey PF-2™ elements reduce filtration flow rate by 15-20%. 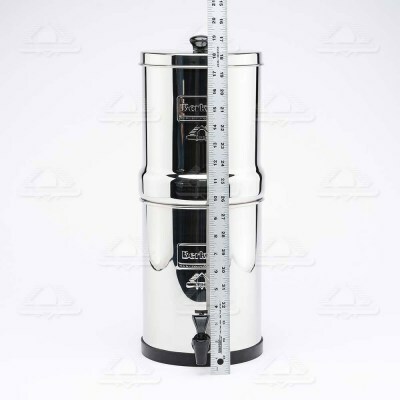 The lower reservoir in most gravity purification systems has a two to three gallon capacity and a typical household uses about one refill per day. We recommend that the upper reservoir be filled at night. The water from the upper reservoir should be purified by morning. 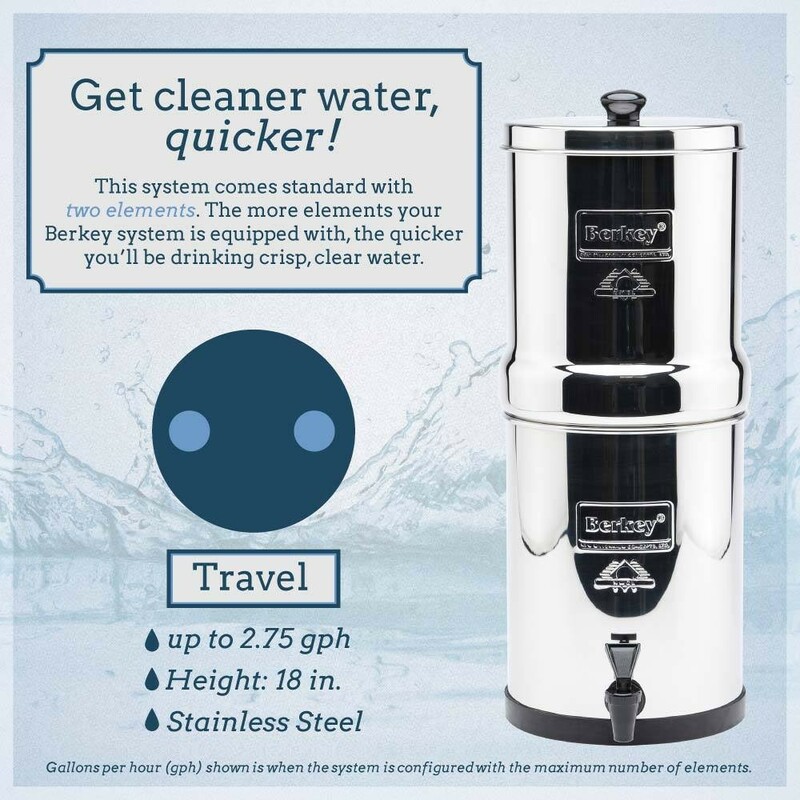 Households requiring more water can speed up the flow rate by drawing off the purified water into a water pitcher or other container when the water level in the lower reservoir rises above the bottom of the Berkey PF-2™ elements.